Magid Handbags developed from the millinery business of Mrs. Anna I. Magid (born Poland/Russia 1870, died Brooklyn 1934) at 38 W. 116th St. in 1901. Her husband, Isaac Magid (born Poland/Russia 1866, immigrated 1892, naturalized 1903) was the foreman in a rag factory on Renwick St. and not involved in the millinery business. At the time of the 1910 U S Census the Magids lived in the Bronx with their 5 children ranging in age from 9 to 18 and Isaac Magid's mother, Paula, age 60. Anna lists her occupation as "Millinery, Own Shop." By 1912 Anna was involved with the Hygrade Ornament Co. at 640 Broadway, a business run by Samuel Blaufeld, Michael Shirk and, somewhat later, Max Posner. Blaufeld and Shirk were in business as "Blaufeld & Shirk, Hats" at the same address. By 1915 Anna Magid was president of the Hygrade Ornament Co. and her daughter, Augusta, was a manager. (Samuel Blaufeld remained as treasurer.) A year later she branched out on her own as "A. I. Magid Co., Millinery Ornaments" at 4 W. 37th St. This business became A. I. Magid, Co. "novelties", "leather goods", and "handbags" at several locations around the East 30s from 1918 to 1936. By 1922 Anna had brought in her son, Morris (who later re-named himself Maurice Magid) and her son-in-law, Leopold Sneider (1896-1971) who had married Anna's daughter Frances. A second son, Leon Magid (1901-1973) joined the business a little later. By the time of the U S Census in 1930, Anna Magid (with husband Isaac) had retired to Miami, Florida, and A. I. Magid Co. was run by the two brothers, Leon and Maurice, along with their brother-in-law, Leopold Sneider. (The brothers Maurice and Leon Magid appear in the 1930 U S Census as ages 31 and 29, Manufacturers of Ladies Hand Bags, living at 687 Lexington Ave.) Maurice Magid was the ultimate survivor, living in 3 centuries (born 1897, died 2001). Paul Magid, Maurice's son, writes regarding the Magid family: "Anna ... must have been quite a lady. In the 1920's she used to drive by herself with her little chihuahua, Izzy, down to Florida once a year. Quite a trek in those days. Her husband Isaac never had anything to do with the business. He worked as a foreman in a factory that reprocessed rags into cloth (shoddy). His wife seemed to be the dominant one in the family... Snieder's wife Francis and my brother's other sister, Augusta (Gus) also worked in the business. They were both very bright and went to Barnard College. My father quit school in the twenties to go to work for his mother in the business, but in the thirties, returned to college (NYU), got his degree and went into business as a real estate developer, doing mostly commercial property work. He recalled his days with the company fondly as it gave him an opportunity to make over twenty trips to Europe by ship as a buyer for [his] mother. He even went to Russia during one of the trips." 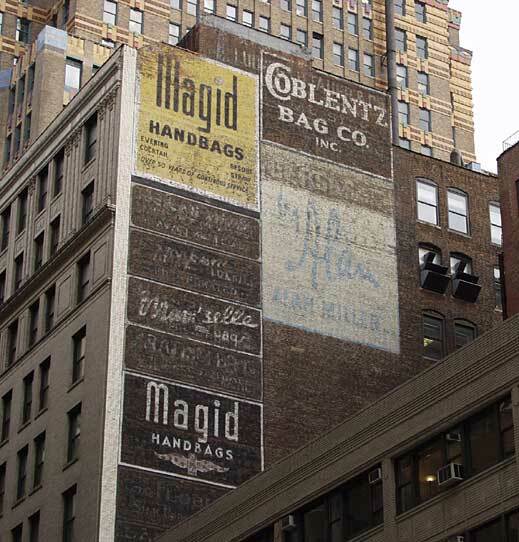 A. I. Magid Co. moved to 30 E. 33 St. in 1937 and became Magid Handbags around 1938/39. The sign says, Over 50 Years of Continuous Service, which should mean that it was painted in the 1950s. Some time in the 1980s the business was sold to outside interests. As of 2003 Magid Handbags still survived as a trade name (registered by Y & S Handbags, 320 5th Ave.) but had no connection with the Magid family. Coblentz Bag Co. moved to 30 E. 33rd in 1938, where they remained until going out of business around 1980. Louis J. Coblentz, born France 1896, was the founder. Alan Miller was a short-lived company located in 30 E. 33 St. no more than 4 or 5 years from 1951 until their demise around 1955. They manufactured handbags for a period of no more than 10 years (approx. 1947 to mid 1950s) but left behind Alan's elegant signature on this wall. Hidden behind the Coblentz sign, but still discernible, is a sign for Ludwig Littauer & Co., . . . Artificial Silk (click for image). Ludwig Littauer & Co. were located here from 1917 to 1930. The proprietor was Ludwig Littauer (1860-1930). He was a yarns and silk merchant in New York City from 1888 until his death in 1930. In 1899 he filed for a passport when he said that he was born Posen, Germany, 5 Oct. 1860, that he emigrated on the S. S. Suevia from Hamburg, 1 Oct. 1879, and that he became a naturalized U. S. citizen in New York, 6 April 1899. Essentially the same facts were included on another passport application in 1923. Ludwig Littauer can be found on the ship's manifest of the SS Suevia sailing from Hamburg 1 Oct. 1879. His mother, Rosalie Litthauer, is accompanied by five children including Ludwig, age 19, and Siegfried, age 6. Siegfried Littauer worked with Ludwig Littauer from the mid-1910s, and was listed as an officer in Ludwig Littauer & Co. from 1917 through 1925. Following Ludwig's death, Siegfried Littauer continued as "wholesale yarns" through 1937. This ad for Ludwig Littauer & Co. appeared in Textile Workd, 16 March 1918. It indicates that mills were located in Beacon and Yonkers, N. Y. The Littauer Family home page on Facebook shows a book written by Ludwig Littauer (1910). The address on the book is 109 Greene St., New York. (This was Littauer's address from 1894 to 1916.) Silk throwing mills are mentioned in Booneville and Yonkers, N. Y. Around Boonville, by Harney J. Corwin (2009), available as a google book shows an undated photo of the Littauer mill in that town. Yet another sign partially visible beneath Magid at the bottom is a sign for the Flobert Silk Underwear Co. (click for image). Flobert were located here from 1923 to 1935. The founder of Flobert was Samuel Dinitz (1897-1940). He was the son of Morris Dinitz (1870?-1934), a furrier, who immigrated from Russia ca. 1891. When Samuel Dinitiz registered for the World War I draft in 1918 he was employed at M. Dinitz Co., 107 W. 25th St., New York. M. Dinitz, Furs, were listed in business directories from 1910 to 1920. In 1936 the Flobert Silk Underwear Co. moved from 30 E. 33rd St. to 136 Madison Ave. They were in business at that address from 1936 to 1972. Flobert also did business under the names Artex Undergarments and Mitzi Negligees. The "Flo" in the name Flobert is probably in recognition of Samuel Dinitz's wife, Florence, but I don't know who the "bert" refers to.